Militants in ATO zone were active in Donetsk and Mariupol sectors, where Ukrainian troops recorded 13 and 10 attacks correspondingly yesterday, reported Ukrainian Ministry of Defense spokesman on ATO Colonel Andriy Lysenko at a press briefing at Ukraine Crisis Media Center. In Donetsk sector, the hostilities took place in Kamianka-Avdiivka-Shakhta Butovka position frontline and near Donetsk airport. Russian proxies used mortars in four attacks: in Kamianka and Pisky, they fired 15 rounds in each location and mortared Avdiivka twice. In Mariupol sector, most ceasefire violations took place in the southern area. “Militants shelled Shyrokyne with mortars and attacked Bohdanivka and Hnutove with grenade launchers. The enemy used only small arms in Talakivka, Vodiane, and Lebedynske,” said the spokesman. In Luhansk sector, Russia-backed militants violated the ceasefire only in Krymske, conducting four small arms attacks there – one in the morning and three in the evening. 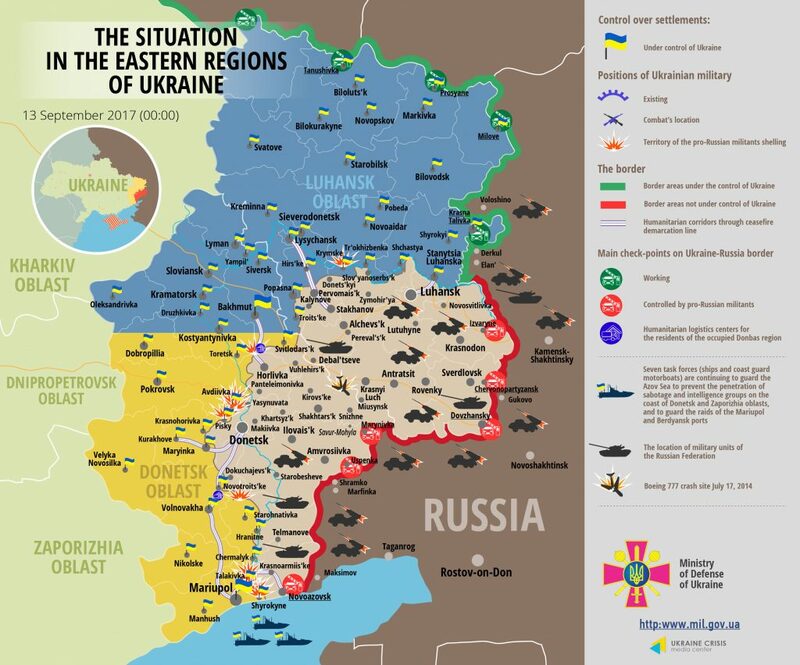 Two Ukrainian servicemen were wounded in action yesterday. Report on the military developments as of September 12 is available here. Interactive data on the shelling: chronology shelling chart and the interactive map.